Our mission is to ensure that all people impacted by cancer are empowered by knowledge, strengthened by action, and sustained by community. The Cancer Support Community is a resource for education and information, and a place to gain support - all in an environment of acceptance and hope. In our local community, special outreach efforts to historically underserved portions of our community have been added - to ensure that we truly are serving all people affected by cancer. 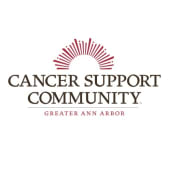 The Cancer Support Community of Greater Ann Arbor is a unique, grass roots organization that was founded locally by a group of committed community volunteers who have each been personally touched by cancer, and who understand that traditional medical treatment is only one piece of successful cancer care. The Wellness Community is governed by a volunteer Board of Directors, and program guidance is offered by a Professional Advisory Board, consisting of experts in the field of oncology and social services. Would you recommend Cancer Support Community of Greater Ann Arbor?